Islamabad: In an effort to quash Indian claims, Pakistan allowed foreign media and envoys to visit the site of Indian air violation on February 26 near Jabba, Balakot district of Khyber Pakhtunkhwa — the site of attack that brought the two countries to the verge of nuclear war. The group including mostly India-based journalists as well as the ambassadors and defence attachés of various countries in Pakistan visited the impact site on April 10, according to Inter-Services Public Relations (ISPR), the media wing of the Pakistan Army. 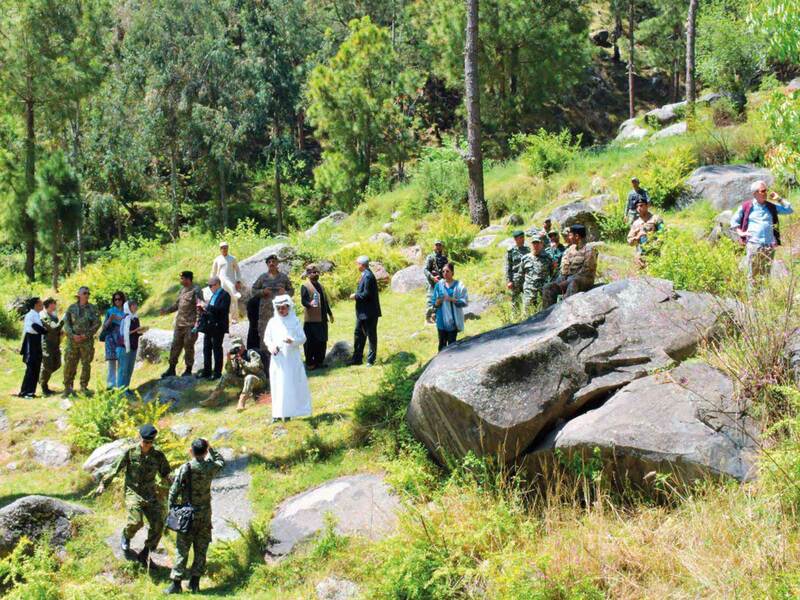 The foreign visitors trailed the rocky site and green pasture to reach the site of “bomb craters of the Indian air strike attempts in barren open spaces with no loss of human life or infrastructure.” Briefing the delegation, Director General (DG) ISPR Major General Asif Ghafoor said the details of the events and ground realities negated the “repeated false Indian claims.” He reiterated that “India should accept the reality” and act like “a responsible state” for greater peace in the region. The group was also given access to a nearby madrasa (Islamic school) where India claimed to have attacked and killed militants in retaliation for Pulwama attack. The visitors were allowed to interact freely with students and teachers and saw for themselves the madrasa, where “local children were getting education, stood on ground and was untouched”. The delegation also toured Army Public School Swat, a state-of-the-art educational facility established by Pakistan Army for the resilient people of Swat, and deradicalisation and rehabilitation centre, Sabaoon, where juvenile offenders undergo psychological treatment, education and vocational training to integrate them back into society. This was the first formal visit of foreign media and diplomats to the place where India said its air strike killed “a very large number” of militant fighters. The purpose of the trip was to bolster Pakistan’s claim that Indian failed to destroy any structure or kill anyone during the air strike of February 26. Although Pakistan invited the foreign media to visit the site the same day after the attack but the visit finally took place after more than a month. Why? “The things were happening very quickly”, said Pakistan Army spokesperson, referring to warlike situation. “As many journalists were present in Islamabad right now so this was a good opportunity to bring them all here together” he added. Pakistani Prime Minister Imran Khan, in his latest interview with foreign media, called on his Indian counterpart to settle the Kashmir issue with dialogue, saying that peace with India would be “tremendous” for the whole region. Tensions flared up between Pakistan and India after a suicide bomber killed 40 Indian soldiers in Pulwama district on February 14. In response, India said it carried out on February 26 air strikes in Balakot, claiming to kill at least “250 terrorists”. Pakistani officials as well as local and international media reported no visible damage. The Atlantic Council’s Digital Forensic Research Lab said that open-source satellite imagery indicated “only impacts in the wooded area, with no damage being visible to the surrounding structures.” On February 27, Pakistan Air Force shot down two Indian jets in a dogfight and captured an Indian pilot who was released within hours as a goodwill gesture. India later claimed that it shot down a Pakistani F-16. Pakistan, however, denied the claim and recently US-based Foreign Policy magazine said that US officials have confirmed that all the Pakistani F-16 jets are accounted for.